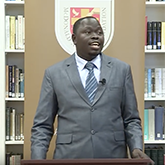 Five leading scholars challenge common assumptions about law and religion in 15-minute talks about women's rights, taxation, race, nationalism, and religious freedom. Prof. Douglas Laycock, Robert E. Scott Distinguished Professor of Law and Professor of Religious Studies at the University of Virginia, delivered the first lecture of the 2019 Harold J. Berman Forum in Law and Religion on February 18, 2019. Prof. Laycock's lecture addressed "The Broader Implications of Masterpiece Cakeshop," and the full video is now available. Since 1982, CSLR publications in multiple languages have been the Center's most visible and enduring contribution to the global conversation about law and religion. CSLR now edits three book series and an international journal, and its faculty and research projects have produced more than 300 books published by leading university and trade presses. CSLR faculty, scholars, and students also publish widely in journals of law, the humanities, and social sciences, and have edited several journal symposia on discrete law and religion themes. CSLR scholars have published more than 300 books and hundreds of articles on issues related to law and religion. 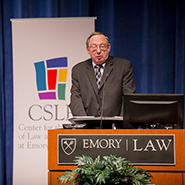 CSLR has published the Emory University Studies in Law and Religion Series since 1990 and our Law and Christianity book series since 2015. Our lectures and conferences attract scholars, religious leaders, government officials, and leading practitioners from around the world as well as nationally and internationally known scholars on the Emory campus. Our Faculty and Fellows contribute significant scholarship to the field of law and religion. Learn more about them on our People page.